The Book: Teachings of Modern Orthodox Christianity on Law, Politics, and Human Nature - John Witte, Jr. 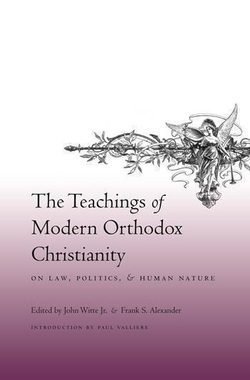 The Teachings of Modern Orthodox Christianity on Law, Politics, and Human Nature examines how modern Orthodox Christian thinkers have answered the most pressing political, legal, and ethical questions of our time. It discusses the enduring teachings of important Orthodox Christian intellectuals of the late nineteenth and twentieth centuries. Leading contemporary scholars analyze these thinkers' views on the nature and purpose of law and authority, the limits of rule and obedience, the care of the needy and innocent, the ethics of war and violence, and the separation of church and state, among other themes. A diverse and powerful portrait of Orthodox Christian legal and political thought, this volume underscores the various ways Orthodox Christian intellectuals have shaped modern debates over the family, the state, religion, and society. The book concentrates on Russian philosophers Vladimir Soloviev (1853-1900) and Vladimir Lossky (1903-1958); Russian theologian Nicholas Berdyaev (1874-1948); Russian nun and social reformer Mother Maria Skobtsova (1891-1945); and Romanian theologian Dumitru Staniloae (1903-1993). "Rarely have the riches of modern theology and theological anthropology been so incisively analyzed for their insights into the fundamentals of our modern political condition." "Crisp, informative, even-handed, and, above all, interesting. It is a joy to learn what riches there are in modern times in the major Christian traditions." "A useful resource and a powerful inspiration." "Extraordinary and exciting book, which deserves a wide audience."